The start of technology which will enable cars to communicate between each other, sharing information which essentially means drivers can ‘see’ what’s happening around the next corner. It’s a combination of hardware which is already fitted to many modern cars, but the tipping point is the growth of on-board internet connectivity. This typically adds an antenna and built-in SIM card for data access via mobile networks providing access to connected features such as music streaming, in-car internet access and WiFi and live traffic updates, as well as emergency services calling. The other part of the puzzle is actually more common. 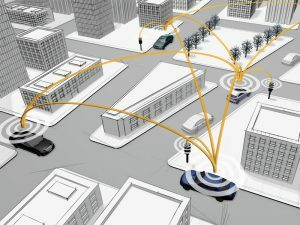 Even the most basic cars now feature a network of sensors which are used to detect and respond to road conditions at a local level, whether that’s hardware for anti-lock brakes, skid control, automatic headlights and wipers or even which airbags have activated and how many passengers are on board. Combining that information provides a very detailed view of the car’s surroundings – weather, grip, the speed at which traffic is flowing. All of that can be aggregated and uploaded to the cloud, before being sent back to vehicles which could be affected by a change in conditions. Think of this as a next step for active safety. Where cameras and radar can only monitor the immediate vicinity, this technology turns all connected vehicles into traffic probes, capable of warning following traffic about accidents, sudden tailbacks and weather conditions ahead. In turn, it means drivers can make decisions earlier and avoid sudden manoeuvres or a collision. Connectivity could lead to vehicles receiving more accurate traffic and roadwork information, and to get live warnings about approaching emergency services. And there are potential benefits for infrastructure, too – the data could be used to alter traffic light sequencing based on traffic flow, and to give better information on gantry signs. Aside from patchy mobile data coverage, which arguably affects some of the areas where this is most needed, the biggest potential issue has always been interoperability. A system like this requires a standardised way for cars to share information, to ensure it’s not manufacturer-specific. And they are working together – the Car 2 Car Consortium includes 17 carmakers as well as technology companies. There’s a clear move to co-operate. It’s already available. Having conducted on-road testing since 2013, Mercedes-Benz has introduced Car-to-X technology in the new E-Class in a move said to be a production first. Recent concepts suggest BMW and Volvo aren’t far behind, and the widespread roll-out of connectivity in new vehicles can only pave the way for ongoing growth. The more cars are part of this social network, the more useful it will become.